SOMERVILLE -- The Tufts University women's soccer team opened 2007 post-season play by scoring its most goals in a game since September 2003 with a 6-0 win against Connecticut College in the first round of the NESCAC Tournament on Sunday. The Jumbos, seeded second, advance to play #4 seed Bowdoin in the semi-final round at Williams next Saturday. 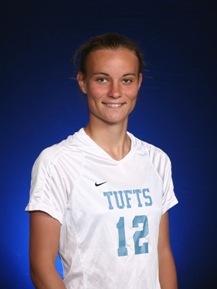 Sophomore Cara Cadigan (Nahant, MA) scored twice for Tufts, giving her 16 for the season and a new Tufts record. She surpassed the 15 scored by Lisa Raffin in 1981. Cadigan's first goal gave the Jumbos a 1-0 lead in the 12th minute on a beautiful play. She took a cross from first-year Sarah Nolet (Los Altos, CA) on her chest and used one touch to beat the goalie and score. Tufts would quickly be up 3-0, adding goals by seniors Lauren Fedore (East Lansing, MI) in the 21st minute and Joelle Emery (Bedford, NH) in the 26th minute. Sophomore Ali Maxwell (Exeter, NH) had assists on both goals. Connecticut College had only one shot in the first half, but would out-shoot the Jumbos 5-4 in the second half. However, Tufts was able to capitalize on three of those opportunities. Sophomore Fanna Gamal (Albany, CA) tipped in a rebound in the 54th minute, Maxwell scored after a carry from midfield in the 60th minute and Cadigan netted the record-breaker off a corner in the 68th minute. Tufts senior Rebecca Abbott (New Orleans, LA) finished with three assists. The victory was the 100th of Tufts coach Martha Whiting's career. It improved the Jumbos to 12-3 overall, the fourth time that the team has won 12 or more games during Whiting's eight-year tenure. Connecticut College was led by three shots from leading scorer Jackie Wade (Medfield, MA). Camels sophomore Jenna Ross (Longmeadow, MA) started in goal and made five saves before she was relieved by Bailey Andrews (Pembroke, MA), who finished with two stops. The Camels' season ends with a 5-9-1 record. Tufts sophomore Kate Minnehan (Hopkinton, NH) earned her sixth shutout of the season with two saves. The Jumbos would finish with an 18-6 advantage in shots, including 14-1 in the first half. The six goals were the most since a 7-0 victory against Gordon on September 9, 2003. Tufts improved to 6-5-1 overall in NESCAC Tournament play with the victory.